For many of you, the routine of the cramped commute to and from work will be a familiar experience. Now and again, if you’re lucky, you’ll find yourself seated, whilst those less fortunate cram into the aisles and steady themselves as best they can. Considering the tightly packed and often uncomfortably warm conditions on such services, passengers generally treat their fellows with respect and consideration, although on occasion tempers can flair when those of a tetchy disposition give vent to their dissatisfaction. Thus it was one night last week that the following incident took place on a train about to embark upon its regular journey, linking a number of our northern towns. The service was busy, and all seats were taken. Some faces were familiar, others not so, and most people had settled down into their early evening routine of texting, surfing the net, listening to music, and amongst other things, staring vacantly into space. A number of people were even engaged in that now seemingly quaintly old-fashioned but agreeable pastime of reading a book in its physical form. For a change, nobody within earshot was speaking at volume into their mobile phone about familial minutiae, their health ailments or pretending to broker an important work deal. All in all, it was a quiet evening, or so it seemed until a voice exploded against the shuffling, sneezing, page-rustling backdrop. I turned my head. Dozens of pairs of ears pricked up. I saw an angry face framed in black, eyes glowering with disgust, glaring towards a woman in late middle age, clutching a small and perfectly harmless dog; evidently, her much-loved pet, but regarded by the indignant black-cloaked figure with as much affection as a witchfinder would have possessed for a solitary old woman’s ‘familiar’. The dog had not touched the scowling woman in black, and neither had it breathed upon her. Its mere proximity was sufficient to prompt the outpourings of an intolerant religious zealot; a scriptural literalist revelling in her power to impose her bigoted opinions without fear of challenge because of her ‘minority’ status. What an ugly scene this was. The lady with the lapdog, clearly upset, moved away, carrying her pet back into a more crowded part of the train, whilst the woman in black sat and scowled. She scowls still, for she is a regular on this service, and her character and cast of mind appear not to be of a sunny disposition. It is owing to this shameful behaviour that her picture, taken moments after the outburst described, has been posted below. The attitudes displayed by the woman in black and the aggressively assertive manner in which they were expressed, are at one with those found in a video entitled ‘Muslim Patrol’ created by some of her co-religionists in London, which portrays a group of intimidating vigilantes seeking to impose Islamic law one Saturday night. It seems that Anjem Choudary’s group was behind this, for one of the voices on the video very closely resembles his. Youtube removed this video, declaring that it had sought to ‘harass, bully or threaten’. However, it can still be viewed on The Daily Mail website here. "Get it away from me!" 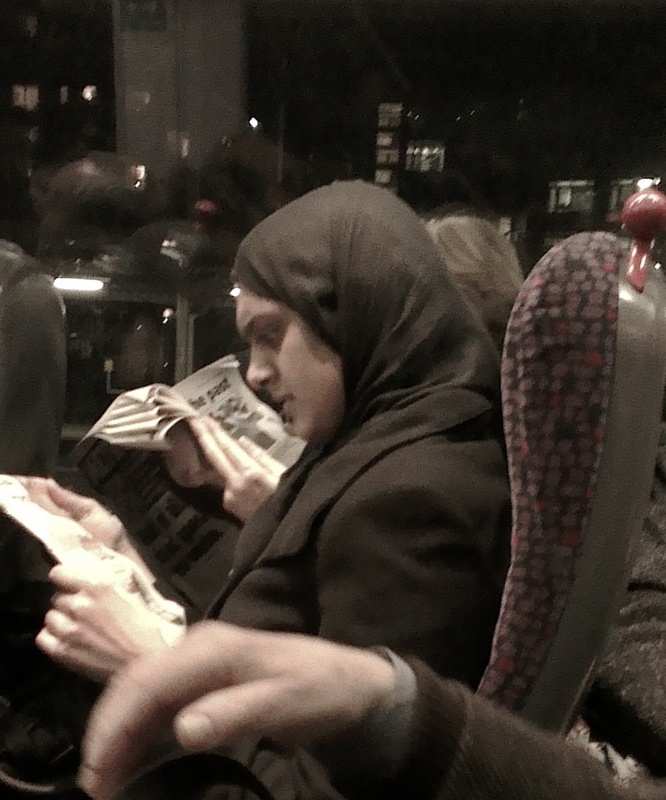 Islamist bigotry on the evening commute. Durotrigan, I think you posted a picture of a bulldog chewing a wasp by mistake. Oh no, hang on I see it now, just another angry muzzie with a huge chip on her shoulder - and an ugly one at that! She has a face that would give Hitler nightmares! Well Rob, let me say that her mood does not generally appear to be positive. Quite why this should be the case, I don't know. Her manners certainly leave a great deal to be desired. No way would I have moved!! This is our fault - we let them get away with it. My thoughts exactly. The middle-aged woman with the dog should have stood her ground, she had done nothing wrong. I wonder if this intolerant muslim would have said the same thing to a big guy with a large dog? Doubtful I'm sure, but if she had and it had escalated perhaps with the transport police for example, I think we all know what side they would have taken. I agree - civility only works with the civilized. This misbehaving children need to be put in their place - however old they are. Thanks to the author for the photo, I suggest anyone carrying a dog on the train go sit as close as possible to her. Even as a cat person, I am disgusted. Pat, if it weren't for certain legislation on the books I don't think that people would put up with such aggressive bad manners, but as matters are, even passing comment on the scowling one's attitudes could land someone in very hot water. Anonymous, I'll let you know what happens should such a scenario unfold. As you rightly state, give these people an inch and they will take a mile; every square mile that we have if permitted. GSW, to your suggestion I would also add that anyone wearing pigskin gloves who has to stand should also steady themselves using her seat whilst wearing the said gloves. She thinks that dogs are "dirty"? Which was the snapping cur in this instance? The dog that did not bark, or the snarling passenger? I believe that owning a dog will eventually be banned. All councils to some extent have implement the Dog Control Orders, which means there are many public areas which you cannot take your dog or that it must be on a lead at all times. And by public areas, I'm talking about the local park, not the high street. For example, my village has a local sports field/park. If it was being used for a football match (local teams) then I would not be able to let the dog off the lead, where as previously I would and we'd just walk around the edge of the park, away from the marked pitch. As with all legislation, it starts off small and more places get added to it, we've already had one or two places added since the council approved the control orders. I think that they will eventually make it so draconian that you'll not be able to take your dog anywhere or let it off the lead outside of your house. You only need to see how the smoking ban constantly gets extended. Let's hope not RH. You are right in noting the tendency of authorities to gradually extend proscriptive regulations though. The louder a lobby group shouts, the more that politicians listen. There are currently more dog owners in this country than those who follow a belief system that deems dogs to be 'dirty', so perhaps the former will eventually mobilise before such regulations to appease Islamists are put in place? Thanks for the link. I'll take a look later. I am strongly tempted to take my perfectly house-trained, very well behaved miniature pig for a train journey which links a number of our northern towns. Now, that would be very interesting! Try any service that passes through Bradford. I've enjoyed reading this blog for a while now but never commented before. I guess I'm a typical British animal lover that it takes a story about dogs for me to get involved! Sad to read this report, but I fear this is actually the calm before the storm. The demographic changes forecast over the next 10/15 years are truly frightening and incidents like this will become more and more frequent. I remember reading about a *blind* person getting on a bus in the Burnley/Lancs area and a Muslim literally screaming because a gentle Labrador had dared to get on board. What kind of ideology, (I won't call it a religion), hates man's best friend? Animals that have served us as companions and hunters for tens of thousands of years? Eventually, (as another commenter has suggested), owning a dog will become haraam in the eyes of the authorities in the same way as smoking. When you have 10/20/30% of the population who dislike dogs due to their bizarre ideology then politicians will give them what they want. They'll have no choice, that's democracy, and our own democracy will be used against us. I think the Right / anti-Islam commentators are missing a trick though here. If you say to people that Islam is a civilisational level threat which will lead us to de facto slavery by 2050 they will laugh and say 'Yeah, right'. If you break down what it will mean in day to day life then we have a chance of convincing people to resist. As the Islamic population grows British life will suffer death from a thousand cuts. Want to walk your dog in the park off the lead like your father and grandfather before you did? Well you can't anymore. You can only take a dog to a park if it is kept on a tight, close lead at all times. Enjoy sitting in a beer garden on a warm day with your friends? Well that beer garden has to be enclosed by a high fence so that no one who might be offended by alcohol can see in. Enjoy a drink on the train after work? Sorry alcohol has been banned on trains because that 10/20/30% of the population don't like it. These are the kind of quality of life enrichments that will happen, I'm sure others will be able to think of many more. Thanks for your thoughtful comment 'Anonymous'. I'm glad that you enjoy the blog. As you note, there have been a number of incidents where Muslims have objected to guide dogs and refused to let them into taxis and protested vociferously about blind people getting onto buses with their dogs. Dreadful. Democracy, as you point out, when combined with a rapidly changing demographic situation could work strongly against us. Democracy in itself is simply a mechanism, not an ideology, and thus could have highly undesirable consequences should the projected demographic changes come to pass. The problem we have to solve of course is how to ensure that these changes do not occur, which is far from straightforward given the manner in which we are currently hamstrung by legislation. Those days of naming a spade a spade are well gone.